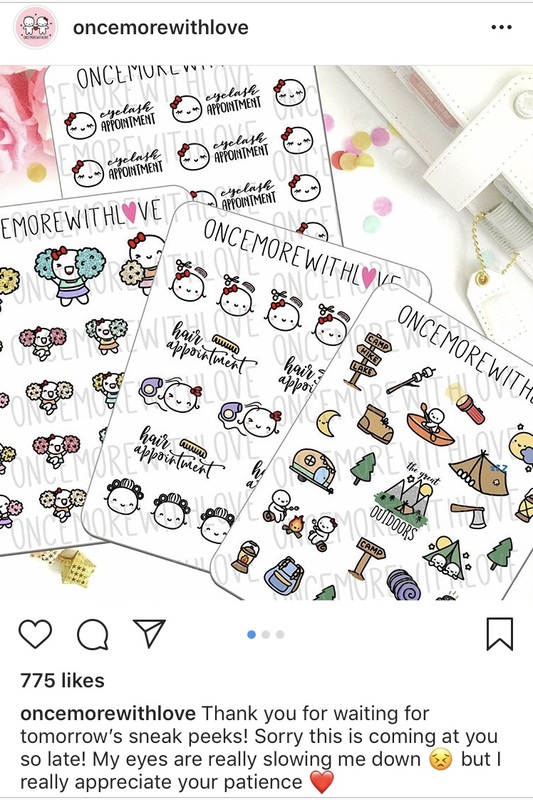 Margaret Ying is the shop owner of Once More With Love, an online planner store that sells stickers with original, hand-drawn designs. This year, Once More With Love has been listed as the 11th best selling shop on Etsy, the world's largest e-commerce platform for handmade items. Since Once More with Love's opening in 2015, the store has over 350,000 sales, 120,000 reviews and almost 50K followers on instagram. It's a sensation in the planner world and has cultivated a royal fan-base. Margaret describes herself as a hopeless romantic who draws inspirations from fairytales and the love she sees all around her. 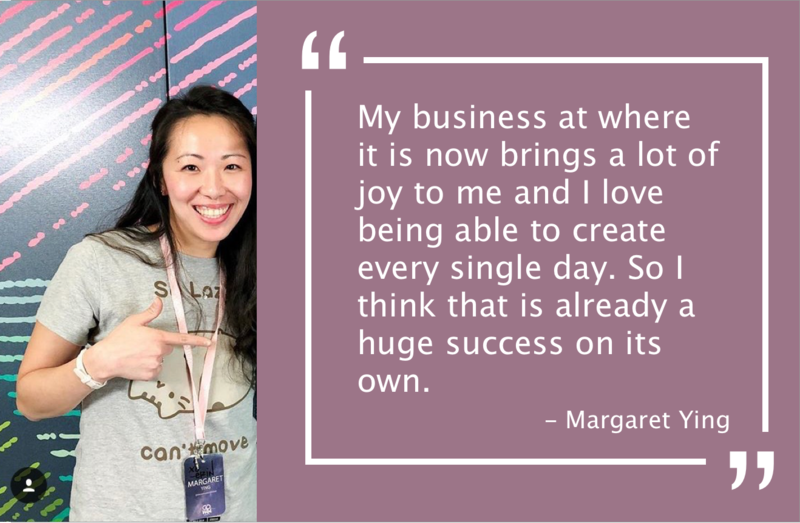 In this episode, you will get to hear the story behind how Margaret turned her passion for hand-drawn stickers into a thriving business on Etsy, and her next steps for Once More With Love. The following excerpts are some highlights from our conversation. Kat: What was the moment that you realized that this is it and you're quitting the visual effect job, and starting Once More with Love full-time? Marg: The moment was sometime in December 2015. It was about a month and half after I opened my shop. It was very close to Christmas, so I ran a X'mas sale. I did a 12-day X'mas sale and there was a different sale every single day. One day, I had a 50% sale and got 13 orders. It took me a solid 2 weeks to work on 13 orders. But for those 2 weeks, I was so excited and happy that I couldn't stop thinking about it. That's when I realized that if this is how happy I feel doing making stickers, I really shouldn't be going back to a job that I didn't love as much as this. The 13 orders weren't that much, but for me it was a huge accomplishment and so much excitement. So I decided that I might as well give it a try. If it doesn't work, it would be easy for me to apply for other visual effect jobs as well. I still use those technical skills today. Visual effects is where I learned photoshop and other editing software, so I still value that experience. Kat: Did you see a sudden growth in Once More With Love or did it take awhile for the sales to hit triple digits? Marg: I'm so grateful for people in the Etsy planner community for taking chances and supporting me. After the first week opening the shop, I had my first order. When December came that's when we I had 13 orders. But nothing really picked up until Jenny from Stick With Me shop promoted me on her Instagram, then people start to support me too. Jenny helped my shop so much, and she also gave me a lot of valuable advice. I would say it took about 4 months to really pick up. But throughout the way, I felt so supported, I never felt alone in the community. It's all thanks to the planner community. I don't know or I haven't been able to find another community quite like this. This community is generally women. We like to empower each other and support each other. That is what makes it so amazing and that's what helps to build my business. It's all these amazing women, and some men as well who came in along the way to support something that they believed in. In addition to stickers, Margaret is expanding the list of items on her online shop. Kat: Besides Etsy, what's your main channel of acquisition? Do you have any other marketing strategies to get Once More With Love out there? Marg: My main promotional platform is Instagram. I haven't tried any paid advertisements yet just because I'm not tech-savvy. But I do want to mention how important Instagram is as a tool. There are other shop owners on Instagram that I made connection with. To be honest, these shop owners are the ones who single-handedly brought up my shop because of their exposure. I reached out to some people out there who already had a following, and they were really kind to help me build my exposure as well. On Facebook, I have a group for the shop. The dynamic is pretty different from Instagram. Facebook group has a lot of interactions happening here. People can write messages, make friends, trade and sell items and show pictures of what they bought. The best part about Facebook is for their polls. I can ask for votes and know what people's preferences are for the stickers. I also do rewards monthly. I poll the top 8 interactive members, and reward them with shop credits to thank them for their positive interactions and keeping the group amazing. So Instagram is better for exposure, Facebook is great for building community. Kat: What are some of your most interesting customer stories? Marg: There are a few customers that come to mind. One of them is a policewoman. She came up to me during a meet-up and mentioned that working in her field is very deep and can get quite heavy. I understand that with that type of work you sometimes see things in the world that you don't want to. So when she comes home, it's such a huge relief to be able to use stickers to express how she feels. she will be able to write about her feelings that day just to get it out. That was one story that really caught up with me. Some other people tell me that they do use the stickers to manage their depression, anxiety, and even their health. I love it when customers tell me that because they make me feel valuable that I'm able to produce something for them. Once More With Love's instagram has almost 50K followers and continues to gain popularity in the planner world. ðŸ§—ðŸ�»What are the greatest challenges you have faced so far and how did you overcome them? My biggest challenge is balancing my shop with my personal life. Right now, I do work from 8am to midnight which is pretty longs hours. I love what I do so for me I don't mind it too much. But it takes time away from my family and friends and I miss them quite a bit. I've been trying to set aside time for myself. I don't know if it's a time management issue or I just need extra help. But I hope that I can figure it out pretty soon. ðŸ¥� What's the most important skill in building your business? Being open-minded and acceptive to feedback and criticism. When I first started, I was really upset hearing criticism from people and that weighed down on me a lot. But I realize that these people are giving me feedback for things that they would like to see and I really should listen to them because that's what my customers want. I know that I need to get over myself and understand that all these people want to support me and they're trying their best to help me as well. ðŸ”­ What's your advice for aspired entrepreneurs? To stay focused and know that you can do anything but not everything. It's also important to find something you're passionate about. If you realize there is meaning and value to the thing that you're working towards, then other people will see it too. ðŸ“š What's a favourite book that you recommend to listeners? Fiction: A Fine Balance by Rohinton Mistry. Everything comes in full circle at the end. This book brings meaning and peace to a lot things that I do. Non-fiction: Creativity, Inc.: Overcoming the Unseen Forces That Stand in the Way of True Inspiration by Ed Catmull and Amy Wallace. Disney has always been a huge inspiration to my life, and this book is about Pixar which does a lot of Disney animations now. This book resonates with me as I try to balance my life and diversify to find meaning in other things as well. You can check out Margaret's Once More With Love shop on Etsy and follow her shop on Instagram and Facebook.